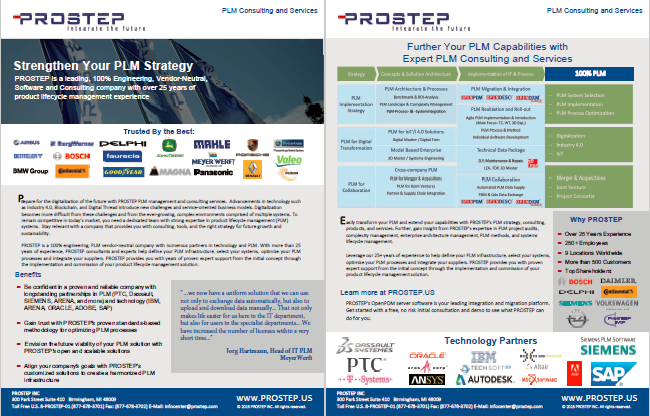 ​With 25+ years of consulting experience and over 250 employees in 9 locations, PROSTEP has the industry know-how, experience and technological partnerships to improve your PLM Strategy. 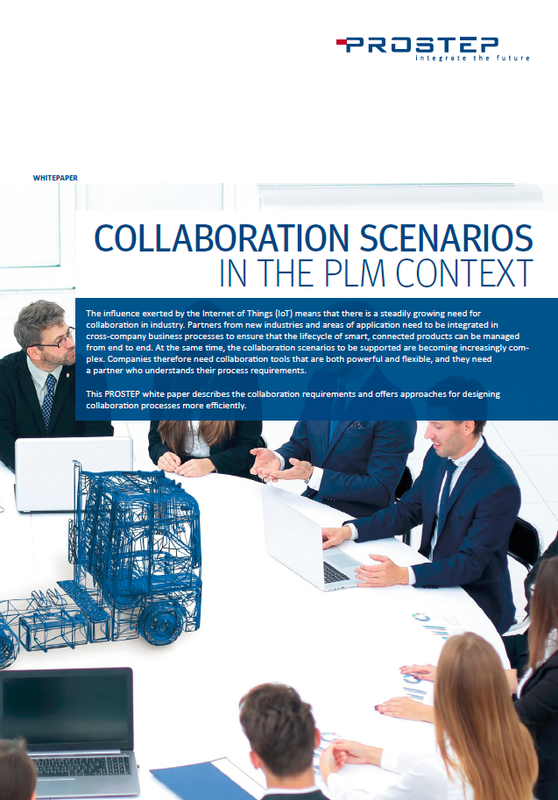 Is Your PLM Strategy Viable for the Future​? ​Are you prepared for newer, faster applications and continued digital transformation ​? Will your systems and architecture scale to fit changing technologies like Industry 4.0 and blockchain? ​How do I Ensure Future PLM Success? ​​We work within a global economy, so joint ventures, divestitures and other long term development scenarios are inevitable​. ​Manufacturers, suppliers and vendors​ are located across the globe, ​ challenging your interoperability, communication and security. To be effective and stay ahead in today's marketplace, you need the proper t​ool sets, expertise and industry know-how. ​Why PROSTEP Strategy and Consulting? ​PROSTEP, ​a vendor-neutral PLM consultant, has developed​ solutions in cooperation with Dassault, SIEMENS, PTC, ARENA and other leading vendors. PROSTEP works with numerous vendors to make certain that our solutions are applicable and reliable across the board. ​PROSTEP provides an extensive toolbox of methods, templates and best practices for the expedient handling of a project. PLM Landscape and Complexity Mgt. How do we integrate PLM, ALM, MES, and ERP? What are some multi-ERP enterprise and PLM - ERP integration methodologies? How do you move from PDM to PLM? How do we integrate OEM customers for direct exchange between PLM systems? What's best practice for enterprise scale PLM deployment? How do you integrate diverse toolsets? What are some PLM and smart factory initiatives? 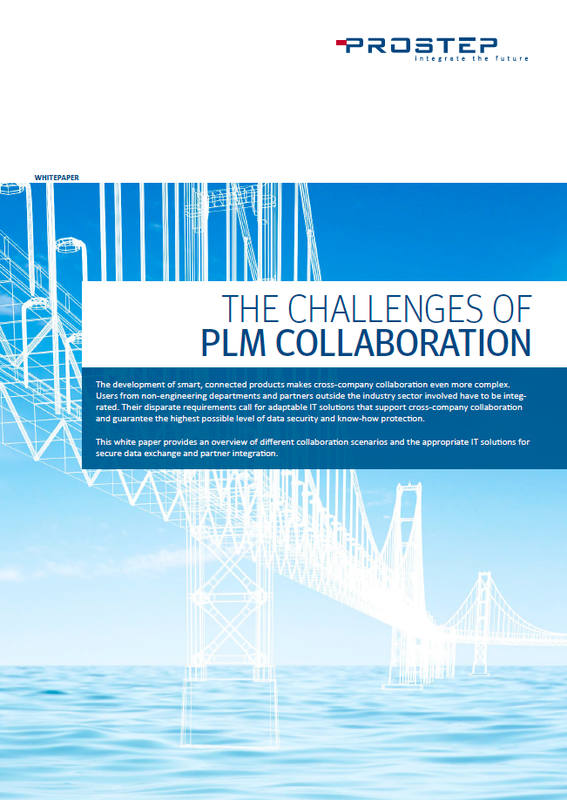 How do we get PLM consolidation into 1 PLM process and system? What are best practices for upgrading PLM system? Our experts can help. Contact PROSTEP for a discussion. ﻿This white paper explores large scale corporations and joint-ventures that need proper mechanisms in place for accurate data exchange. It also highlights the importance of collaboration tools that can be configured flexibly. This white paper describes collaboration requirements and offers approaches for designing processes more efficiently.